In Germany, it is exclusively available at Sport-Tiedje! 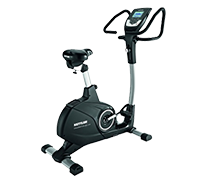 The Schwinn Airdyne AD8 combines the advantages of a joint-gentle bike ergometer with the training effects of an elliptical cross trainer. You decide individually how actively you use your body and turn a classic training with a fitness bike into a highly intensive whole body training without limits. The AD8 is perfect as alternative at a gym or for cross training. 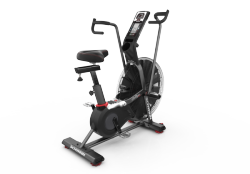 Schwinn Airdyne AD8 - Combination of elliptical cross trainer and bike ergometer! The Airdyne AD8 is a very well designed machine. It is simple to put together, and after assembly it stands solid as a rock, allowing you to perform HIIT without even the slightest sign of wobbling. The ability to adjust the seat forward and back as well as up and down makes it a great choice for people of all different sizes. The display is intuitive and very easy to use. Great product, I would buy it again without hesitation! This is a great tool for cardio-fitness and lose weight. In a few days I got excellent results. this is a great tool for cardio-fitness and lose weight. In a few days I got excellent results. Very well it recommended for warming the muscles. Schwinn ergometers differ from other ergometers in their special brake system. The patented air brake systemof the AD series of Schwinn is unique in the world of cardio equipment. Besides cardio training, the AD machines allow you the warming up and activation of the shoulder girdle at the same time. These machines are getting more and more popular in Germany, because they are more challenging and more varied than usual ergometers on the fitness market. The handlebar is also a special feature of the Schwinn ergometers. Compared to common ergometers, this one moves actively with the user. Being the user, it means for you that can train actively with your arms and upper part of the body. Besides the machines like the AD6 for upscale home use, Schwinn also offers the Schwinn AD8 in its range for (semi-) professional use. This machine is designed for a daily use of more than seven hours and is thus extremely sturdy and of durable built.